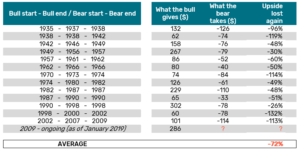 As this bull market possibly enters its final stages it is important to prepare your strategies for late cycle corrections with downside protection. In November 2015, when the bull market was in full swing, we argued in our research note that a systematic strategy is the best way to stay invested while being ready to pull the plug at any moment. What happened in the 38 months since? The S&P500 rallied another 40%, reached an all-time high in September 2018, dropped nearly 20% until the end of 2018 and then rebounded on low energy. Many investors are, or seriously think about, reducing their equity exposure. Similarly, our models have reacted with more pronounced adjustments of market exposure over the last months. What is then the difference between systematic models and a discretionary approach? Focus. Focus on what you are good at. Good investors have a skill in determining long-term fundamental trends. But few investors are good at timing the market. You need a strategy with clear indicators of when to reduce your exposure. You need clear indicators of when to reenter once the market rebounds. And you need the discipline to follow your rules. These are not human strengths. Especially during a market crisis. The beauty of this approach? 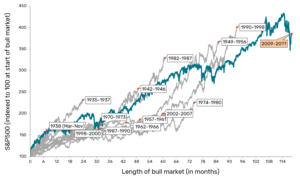 It stays the same during the bull market of 2015, in today’s no-man’s-land, and in a new future bear or bull market. Your investment always keeps your strategic focus but dynamically adjusts market exposure based on the trading signals generated by our quantitative fund partners. Copyright 2019. Sanostro AG All rights Reserved.